Google released an update to its iOS search app today that includes Gboard integration. Gboard is Google’s alternative to the iOS system keyboard and one of the better third-party keyboards available on iOS. The keyboard supports web, image, and GIF searches, instant-answer search results, multiple languages, 3D Touch cursor movement, contacts, and other features. Gboard must still be installed by navigating to the Keyboard settings in Apple’s Settings app, but after you do that, Gboard’s settings can be adjusted in the Google app instead of the separate Gboard app. 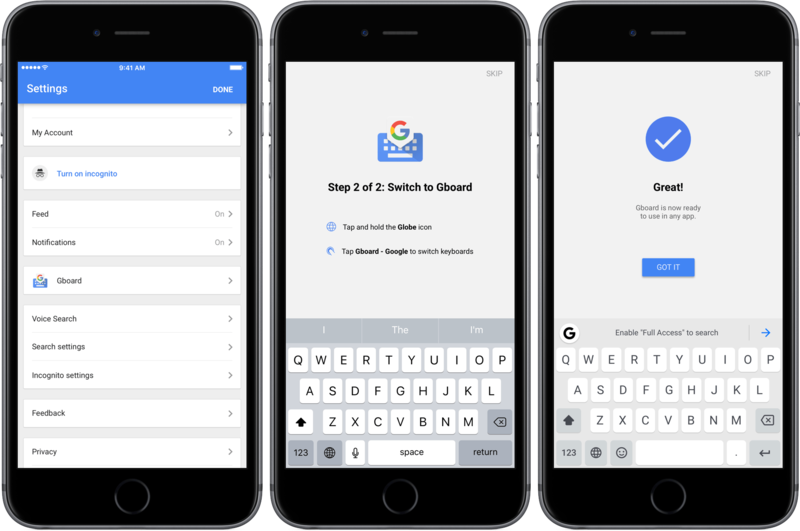 The downside of the new approach is that if you already have Gboard installed, it is now possible to have two Gboard keyboards installed at once – one from the standalone Gboard app, which is still available on the App Store, and the other from the Google app. If you’re a Google app user and already have Gboard installed as I did, I suggest deleting the Gboard app because there is no reason to have two instances of the Gboard keyboard installed.